Fire safety at home has become a hot topic for rural and suburban gardeners as the number of homes destroyed by raging wildfires has increased. Buildings in the wildland/urban interface—that space where nature is pushed aside to make way for people—are especially vulnerable if fire safety is not factored in at every stage of planning and development. Flying firebrands, embers blown on the wind ahead of the flame front, are a major wildfire threat. Firebrands can travel great distances and lodge in the corners and crevices of a home or ignite an overgrown landscape crowding close around it. Even a home sited in acres of parking lot is vulnerable to flying firebrands. Designing homes with common fireproofing features like fire-resistant surfaces and finishes, minimizing roof eaves, removing overhanging decks and fencing, and avoiding dense, invasive, or poorly maintained landscaping is critical to fire safety. Avoid building structures in natural chimneys such as at the top of a narrow canyon or close to the edge of a steep slope. Reduce flammable material closest to the home. Flying firebrands will have little purchase in a green landscape composed of low-fuel volume plants. In the absence of the homeowner or a fire crew, a landscape of fire-resistant plants can help to slow the spread of fire around the home. Maintain open space around the home to allow firefighters and their equipment to safely operate without having to deal with masses of burning material close by. When choosing plants for the fire resistant garden, look to plant retailers like High Country Gardens or Annie’s Annuals as your source, and use the gardens of Scott Ogden and Lauren Springer-Ogden as your guide. Their book, Plant Driven Design, (Timber Press, 2009) offers a wealth of low-water-use, colorful, and casual plant combinations that are perfect for low-fuel gardens in the “Lean, Clean, and Green Zone” closest to the home. This is the area within 30 feet of the home where firefighters will do hand-to-hand battle with flames. Farther from the home, in the next 100 feet from the walls, nature-inspired plantings include masses of perennials, roses, and well-spaced native and introduced shrubs with carefully placed trees as accents. Plant choice is important, but annual maintenance is critical. 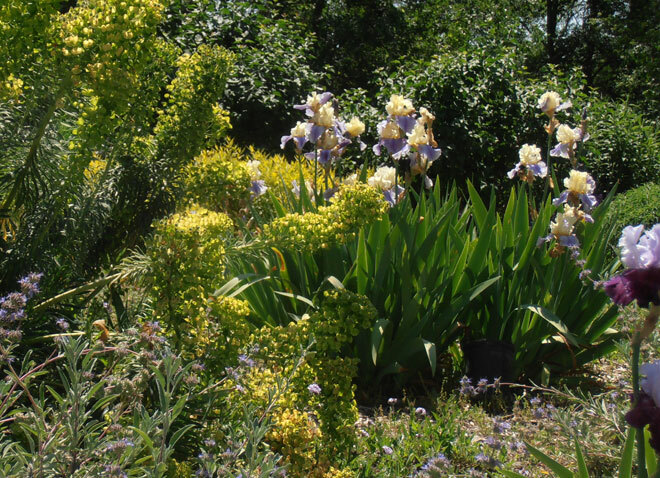 Fresh, green growth is less likely to burn during a wildfire and, in the case of perennials, allows them to simply wilt instead of adding more fuel to the fire. Remove dry, dead material from the centers of shrubs, trees, and vines to reduce their vulnerability to flying embers. ‘Roger’s Red’, an especially red form of our native California grape (Vitis californica ‘Roger’s Red’) is a choice fire-safe plant I’ve planted at the base of porch columns on my own home. The vigorous plants quickly scrambled up the columns, at which point I trained two leaders along the eaves. Each summer, annual growth drapes down like a leafy curtain sheltering my west-facing windows from the harsh summer sun. As summer and fall progress, the apple-green leaves of ‘Roger’s Red’ become suffused with red and amber, deepening to scarlet and purple with the first chill nights of fall. In a fire, the plant’s thin, moist leaves simply wilt. Annual pruning removes all but the structural framework of the vine trained along the eaves like wine grapes on a trellis. Instead of a thick mass of honeysuckle or wisteria, this native, drought-tolerant plant offers a clean sweep each spring, vigorous growth for shade, and brilliant fall color. I love native plants, but often the focus is primarily on spring color with little consideration for the other seasons. 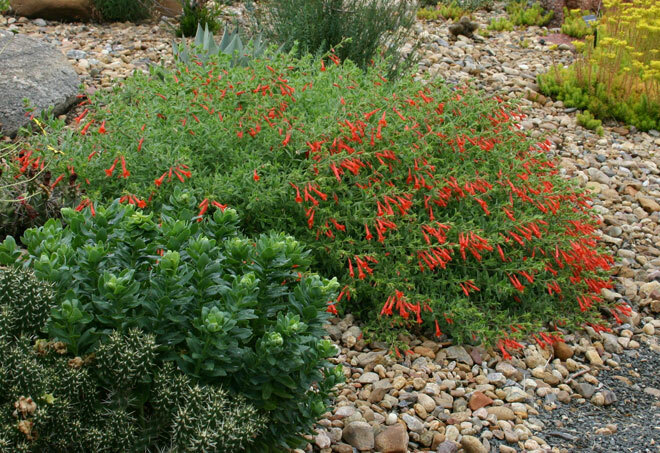 California fuchsia, sometimes called hummingbird trumpet, (Zauschneria californica) is a California native that adds color and spark to late summer gardens. 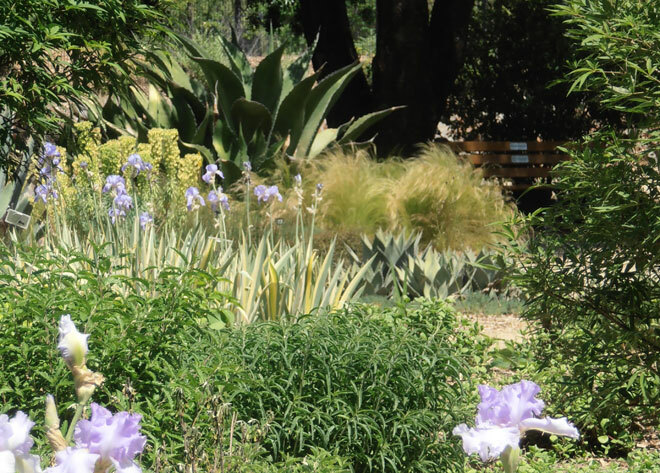 Several years ago, Pacific Horticulture published an evaluation of Zauschneria cultivars by Bart O’Brien of Rancho Santa Ana Botanical Garden. I have returned to that article again and again as a reference. One cultivar that stood out in the evaluation and in my own observations is Z. c. ‘Catalina’, a hefty specimen growing to around four feet high under favorable conditions, but usually standing two to three feet tall and as wide forming a mass of silvery foliage topped with vibrant orange red blooms from August until frost. I have found Zauschneria to have the heft of a shrub without the twiggy mass, and the plant benefits from hard pruning after frost to clear away the old growth. Hummingbird Mint (Agastache) offers impressive color and fragrant foliage. The plants grow best in hot climates with deep soil and should be watered well at the onset of blooming to prolong the flowering season. Agastache rupestris and A. aurantiaca can grow to four feet tall and as wide in a single summer, but they may take a while to get established in cooler coastal gardens. Agastache cana offers dwarf varieties like ‘Apricot Delight’ and ‘Purple Pygmy’ that flourish in cooler conditions and are ideal for container displays. Agastache blooms purple, pink, peach, salmon, or orange—a blend of shades that contrast well with lavender. Garden asters are another often–overlooked choice for fall garden interest. Numerous cultivars of this large plant family offer strong color in late summer when many other perennials are fading. A perfect foil for late-summer roses—and when pruned back hard in late fall to remove spent foliage—asters are another fire-safe favorite. James Van Sweden showed me his passion for simple native asters such as Aster divaricatus ‘Raiche Form’ and A. oblongifolius, which was chosen as a Missouri Botanical Garden Plant of Merit in 2003. In his bayside Maryland garden, I admired how they grew in free-form masses among the grasses and rudbeckias and under copses of trees. After a visit to Western Hills Nursery in Occidental, I came to admire the bold Aster tataricus, with clouds of blue blooms on stems to four feet. Aster oblongifolius ‘October Skies’ sports arching stems topped with masses of sky-blue flowers in mid- to late summer with a mildly wild look that complements both refined and natural style gardens. Closely related to asters, Boltonia asteroides ‘Snowbank’ is an impressive, tall plant bearing clouds of dusty white blooms. I am not a fan of New England asters; the ultra-dwarf forms appear awkward and artificial in the garden, like plastic flowers. My inclusion of roses in a fire-safe landscape rankles many people who do not recognize their adaptability. In my experience, many roses—especially hybrid musks and landscape roses—are amazingly tough and will weather any challenge with grace and beauty. Some of my personal favorites include the hybrid musk ‘Sally Holmes’, with large trusses of buff to white single blooms, and ‘Mermaid’, which offers vigorous arching stems with single bright yellow blooms. Rosa glauca has incredible purple-tinted (glaucous) foliage dotted with tiny pink blooms in early summer followed by showy orange hips in fall. The common landscape rose ‘Flower Carpet Red’ cannot be beat for its masses of red semi-double blooms and outright vigor. Groundcovers are the workhorses of the fire-safe garden. They carpet the ground with foliage and flowers, yet offer ideal low-fuel volume that is essential nearest to the home. A well-maintained groundcover, whether it is a low-care lawn of UC Verde® buffalograss (Buchloe dacryloides), a carpet of iceplant (Delosperma), or layers of native Manzanita (Arctostaphylos) can help snuff out firebrands that land near the home. Succulents are often portrayed as the ultimate fire-safe plants, but few gardeners can use the full spectrum of frost-sensitive species common in coastal gardens. In her wonderful book Hardy Succulents, Gwen Moore Kelaidis lists a colorful spectrum of hardy South African iceplants including the spectacular purple-flowered Delosperma cooperii, which has become common on nursery benches throughout the West. ‘Fire Spinner’, a recent iceplant introduction, should prove to be a knockout in the garden. Less hardy but just as spectacular, Drosanthemum speciosum and D. micans, form low shrublets covered in iridescent, silk-floss blooms in fiery colors. Groundcover sedums are gaining popularity with the introduction of several improved southwest natives. I still prefer Sedum album, which could almost be called a weed for its ability to fill in around other plants like a living mulch while sporting grass-green foliage and shining white blooms in late summer. I’m also impressed by spreading prickly pear (Opuntia fragilis f. denudata) which forms highly textured carpets of jointed, prickly stems topped with watermelon-pink or satin-yellow blooms. Seasonal bulbs are perfect groundcover companions. Spring-, summer-, or fall-blooming bulbs might just be the ultimate fire-safe choice. They disappear without a trace when dormant, sheltered from the flames below ground, only to emerge like the Phoenix from charred earth. Narcissus, crocus, lycoris, and others are well known, but I particularly admire the native tritelia and calochortus that abound in the fields around my Northern California garden. Choose from a wonderful selection of ornamental onions (Allium sp. ), which fit into wild and refined gardens alike. I especially like drumstick allium (Allium sphaerocephalon) with deep purple blooms on slender one-foot stems which increase slowly but dependably in dry soil. Larger flowered types, such as A. christophii and A. giganteum, perform best with summer water. In areas that receive summer irrigation, I go for lasting impact with bold clumps of canna lily ‘Red King Humbert’ (Canna x generalis ‘Red King Humbert’). Large, purple-green leaves extend to a stunning 8 feet, topped with bright red blooms from summer to frost. The stout stems remain upright in wind and the leaves seldom tatter like ornamental bananas, nor do they scorch in high heat. Add some apricot from the Agastache ‘Acapulco’ and the deep tones of Salvia ‘Purple Majesty’ for a late-summer-blooming, flame-resistant combo that proves how beautiful and dynamic a fire-safe garden can be! Education, maintenance, and good plant choices are the foundation of a fire-safe garden where everything comes together to create a vibrant outdoor living area, providing year-round interest for you, while giving firefighters a fighting chance to help save your home from a wildfire.